According to Business Insurance, Wallace Welch & Willingham (W3 Insurance) is a workplace where employees thrive, achieve job fulfillment and assist with company growth. These attributes contributed to the agency’s inclusion on the publication’s annual Best Places to Work in Insurance list, which was announced September 24. “Being named to Business Insurance’s list of the Best Places to Work in Insurance for 2018 demonstrates that W3 has built a culture in which employees are supported and engaged, which benefits their customers and their employer’s financial performance,” says Peter Oxner, publisher of Business Insurance. The Best Places to Work in Insurance list includes agents, brokers, insurance companies and other providers who provide the highest levels of employee engagement and satisfaction. Leading insurance industry employers are identified by Best Companies Group through a two-part assessment. The first, a questionnaire, is completed by the employer and encompasses company policies, practices and demographics. The second is a confidential employee survey that measures engagement and satisfaction. W3 Insurance CEO Scott Gramling points to the company’s ‘Raving Fans’ philosophy as a huge indicator of organizational success. Taking care of employees is extremely important, he says, and the W3 team naturally extends that passion to client services. This year’s list features 75 companies of various sizes, from 25 employees to more than 4,000. Overall rankings and winning company profiles will be unveiled as a sponsored content supplement in the November issue of Business Insurance and online at BusinessInsurance.com. Founded in 1925, Wallace Welch & Willingham (W3 Insurance) is an independent insurance agency with a rich tradition of service and unwavering commitment to clients and community. The agency represents an extensive list of “A rated” carriers in order to provide the best coverage at the most affordable rates available. W3 Insurance offers coverage for the specific needs of businesses and individuals, including homeowners, auto, boat and life insurance as well as employee benefits coverage. For more information, call (727) 522-7777 or visit www.w3ins.com. St. Petersburg-based agency lauded for its community service efforts and growth. During an awards ceremony held February 11 at the Tampa Convention Center, Bright House representatives commended the honored businesses for improving the Bay Area as a whole. The nominees were thanked for seeing possibility where others see problems, and encouraged to continue their tradition of excellence. This is the second year that W3 was named a Bright House Regional Business Awards finalist, with it’s first time being in it’s 2014 inaugural year. Visit Bright House Regional Business Awards for a full listing of the 2016 Tampa Bay Finalists. We are pleased to announce the promotion of Jonathan Hammond to Chief Operating Officer. Hammond began his insurance career with Wallace Welch & Willingham in 2000 as a sales producer. Later, he was promoted to sales manager and earned three designations: Certified Risk Manager, Certified Insurance Counselor and Construction Risk & Insurance Specialist. He has been a sales leader throughout his career and has won accolades that include the distinguished national award from Marsh Berry, Senior Producer of the Year. Hammond was selected as a member of the Leadership St. Petersburg class. Please join us in wishing Jonathan a well with his new position. Wallace Welch & Willingham (W3) is pleased to announce the addition of Sondregger Insurance agency, an independent agency based in St. Petersburg, Florida. With this addition, made final on December 9, 2015, W3 continues to exceed its growth objectives. Sondregger Insurance specialized in personal insurance and business insurance. The agency brings one employee and approximately 800 clients, increasing W3’s personal lines book of business by approximately 40%. Sondregger’s book of business consists primarily of homeowners policies with a number of commercial, auto and life as well. Clients will continue to work with their agent and will be serviced out of W3’s current Downtown St. Petersburg location. This was a perfect fit for W3 and Chris Sondregger, the owner of Sondregger Insurance. W3 was looking to maintain steady growth goals while maintaining its ownership model of internal perpetuation. Keith Gramling, W3’s President, stated, “Through the addition of Sondregger Insurance, we continue to achieve our agency growth goals. We are pleased to welcome each of our new customers and look forward to the next agency owner who would like to be a part of our culture. Celebrating our 91st year, we are now a composition of 27 independent agencies.” This recent addition marks the third in three years, and includes the acquisition of Al Malin’s Insurance in 2013 and a large book of nonprofit business in 2012.
Business Insurance, a national publication for independent insurance agents and brokers. This is the tenth award that W3 employees have won or have been named as finalists for this year. W3 employees participated in an independent, confidential survey by Best Companies Group, commissioned by Business Insurance, which was then analyzed based on the eight core areas believed to show company culture and employee engagement and satisfaction. These core areas are leadership and planning; corporate culture and communications; role satisfaction; work environment; relationship with supervisor; training, development and resources; pay and benefits; and overall engagement. W3 placed 13th in the U.S. Small Employer Category. Walt Grayson, W3’s COO, stated, “The acknowledgement as “Best Place to Work” is the result of all 92 employees wanting to be a “Best Place”. This couldn’t be done without the commitment from everyone.” Business Insurance covers core risk management and insurance areas such as property/casualty insurance, health insurance, captive insurance and other risk management. 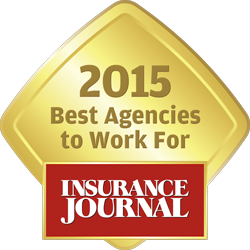 W3 is pleased to announce that we have been chosen as Insurance Journal’s 2015 Best Agency to WorkFor, Gold Winner – Southeast. The Insurance Journal is a national publication that is considered the most read national property and casualty publication for independent insurance agents and brokers. They break their readership into five areas of the country and award a gold, silver and bronze winner for each division, as well as an overall winner. Click Here for Insurance Journal’s full article featuring the agency. W3 employees nominated the agency back in September by answering a short, informal survey. A customer-centric focus, strong value system and a family-matters philosophy helped propel W3 to the top of the list. Scott Gramling, W3’s CEO, stated, “Over the past 90 years, W3 has been a top shelf employer, because the leadership acknowledges that constant attention is necessary to attract and retain the highest caliber professionals.” “Our goal is to actually be the best place to work. We don’t do it for the awards, it’s really about the employees,” said COO Walt Grayson. Wallace Welch & Willingham (WWW) is pleased to announce that it has been selected again as one of the Tampa Bay Times Top Workplaces. The determination of Top Workplaces is based solely on employee feedback. A winning combination of competitive compensation (including profit sharing bonuses, a merit program and 401(k) retirement plan with match), robust benefit package, and overall company culture is what makes WWW a Top Workplace. The Tampa Bay Times published the complete list of Top Workplaces on April 12. For more information about the Top Workplaces lists and WorkplaceDynamics, please visit www.topworkplaces.com and www.workplacedynamics.com.